Teachers typically establish benchmarks and monitor fluency progress for both speed and accuracy. Tracking the number of words a child can read correctly in a minute (WCPM) provides a great activity to monitor fluency. It is quite simply; all you need is two copies of a passage, a highlighter and a stop watch. Select an unfamiliar passage with an appropriate level of difficulty. Make two copies of the passage – one for the reader and one for the administrator. Give one copy to your child and use the second copy to mark errors. Instruct your child to begin reading when you give the signal. Using the stopwatch, time your child reading for one minute. Omitting or adding a word. Stop counting after a minute and add the number of words read correctly. 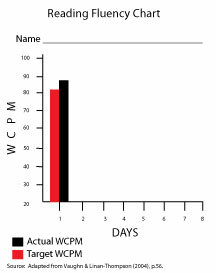 Try to obtain an average WCPM and perform this exercise two to three times with other passages. Chart the results. To assist in tracking, consider adding the date and to prevent reading duplicate material, add the title of the passage below the date. If your child is below average (see table below for averages by grade), perform this exercise every two weeks. However, those children who are average or above-average, should perform this activity three times per year – beginning, middle and towards the end of the school year. After you obtain your child’s WCPM, compare it to the national norms. The tables below contain the national norms for second, third and fourth grade. National norms do not exist for kindergarten or first grade; fluency instruction typically begins in the later part of first grade or after a child develops strong word identification strategies. Above average represents reading norms in the 75th percentile, average represents reading norms in the 50th percentile and below average represents reading norms in the 25th percentile. modeling and rereading exercises . An average or above average child should continue to work on their fluency rate and increase the passage’s level of difficulty or benchmark. Make sure you praise your child when appropriate and provide encouragement while he is learning to read. Source: Adapted from Vaugh & Linan-Thompson (2004), p.57.